KaBling Jeweled Cables Are Simply Terrifying | OhGizmo! I like keeping my office looking good, and thus I tend to purchase items that will compliment the ones I already have. One thing I don’t usually put too much thought into is my network cables (or any other cables for that matter). I have a nice spool of blue Cat5e that suits me just fine, and I make new cables as needed. After all, it’s not like anyone should be seeing my cables, so who cares? Well if you’re someone that cares, and has an insatiable need for all things pink, then I think I’ve found something right up your alley. 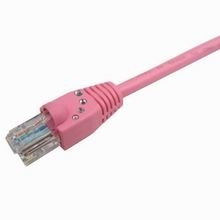 Cables Unlimited has released a line of cabling that is aimed at pink-loving geeks everywhere. You can choose from networking, HDMI, 3.5mm audio, USB and AC power cables. Each are colored pink and feature a number of crystals embedded in them. I can’t say I know anyone that would go so far as to buy pink cables, but at least those that do can be comforted knowing they are supporting a good cause. 10% of the proceeds go toward the National Breast Cancer Foundation. Cables range in price from $9.99 to $24.99. I'd be willing to buy pink cables knowing that it'd support the National Breast Cancer Foundation. But the bejeweled aspect of it is just too much for me. What are the odds of an extremely girly pink-loving and geeky girl anyways? Supporting breast cancer with the pink, I get. But the jewels? Really? I don't think this would be seen in my cube, it would be hidden. I don't think I would want pink either, I kind of hate pink.. But I do agree with Esprit's breast cancer idea.